Sorry in advance about what seems like a trivial question. However, I've recently switched from PC to Mac, and while I'm really happy about the switch, this is one of the few issues I'm struggling with. On a PC, the most important shortcuts are CTRL-A (select all), CTRL-C (copy), and CTRL-V (paste). Almost all the other important shortcuts also use the CTRL key. On the PC keyboard, the CTRL key is in the bottom left corner of the keyboard. So, it's very easy to hold it with your pinky, while keeping your hand in its normal position, so you can easily press the other key required for the shortcut (e.g., A, C, V, etc). On a Mac, the "equivalent" key to CTRL is Command. However, I can't easily reach that key with any finger - especially without moving my hand from its normal position - so, I can't easily press Command-C or Command-V without really focusing on it. Is this just a result of years of practicing on a PC? What finger do Mac users use to click the command key when executing a shortcut? You can use either thumb to hold down a ⌘ key and then use another finger to access the other key. You just have to get used to sliding either thumb a little to the left or to the right of the space bar. Yes, this is just a result of years of using a PC. Use a light touch when typing or using the trackpad and keep your hands and ngers relaxed. Avoid rolling your thumbs under your palms. Based on this, it would be my assumption that they intend you to either move your entire hand and use your thumb or pointer finger. If you find this unnatural, you can always change the control key to perform the duty of the command key. Open System Preferences > Keyboard > Modifier Keys, and change the buttons around as you see fit. I mostly use my thumb. If I'm trying to hit a key that's more in the middle or right side of the keyboard (such as C or V), I use my ring finger. Note that I'm a horrible typist, so I never use the right ⌘ key. If you're comfortable using that, you can probably just use your thumbs. 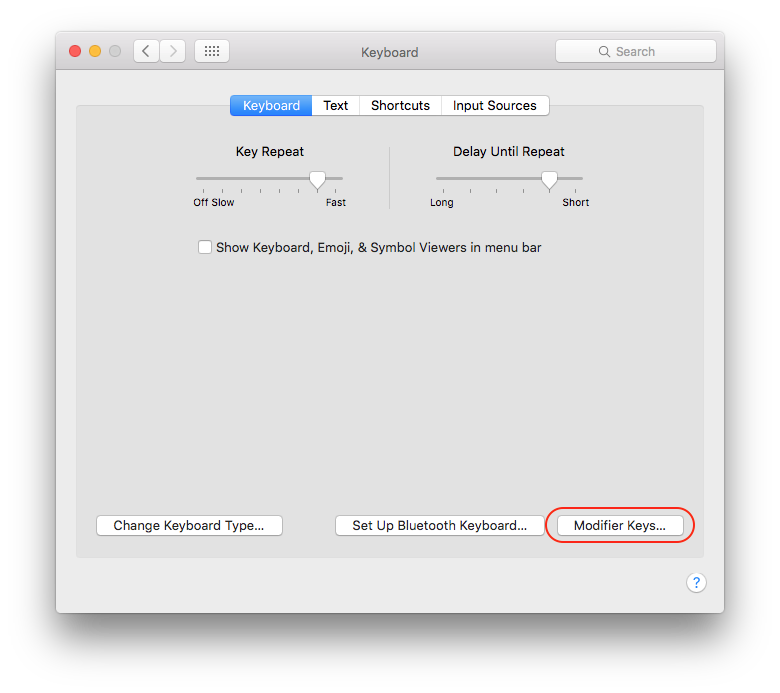 When I first made the switch to Mac I used System Preferences -> Keyboard to switch the ⌘ key with ^ (control) key. That worked for a while until I became more comfortable with the basic two-key commands. Once I started using more complex three and four key commands I had to put it back to default because I needed the labels on the keys at first to remember what the symbols <-> key mappings were. It's easier to type shortcuts if you use Sticky Keys as well. This way you can type shortcuts one key at a time, which might sound slower, but isn't if it means you can keep your hands in position and your eyes on the screen. I tend to use my thumb for command. I use my left pinky for control, shift and Fn, although it may be different for others as I keep my pinkies over the row below the home row. Alt is tricky, but I guess the pinky makes the most sense for me personally, usually. There's nothing wrong in using different fingers at different times. For instance on the rare occasion I want to show the Dock (⌃⌥⌘F) I move my arm and use index on cmd, middle on alt and ring on control, then type the D afterwards. I also thought it was inconvenient at start but later realised how good it is with the command button. I learnt to type on a keyboard with no markings which requires you to have all keys memorised and your fingers on the right position on the keyboard. By using the command button with your thumb (which is regularly only used for the space ), your fingers are always positioned correctly on the keyboard. Using the control button, you HAVE to use your pinky finger which makes your fingers leave the correct position, which in the end makes you look at the keyboard! Scrolling with MacBook trackpad: Is it possible to do with only one finger while a key pressed? 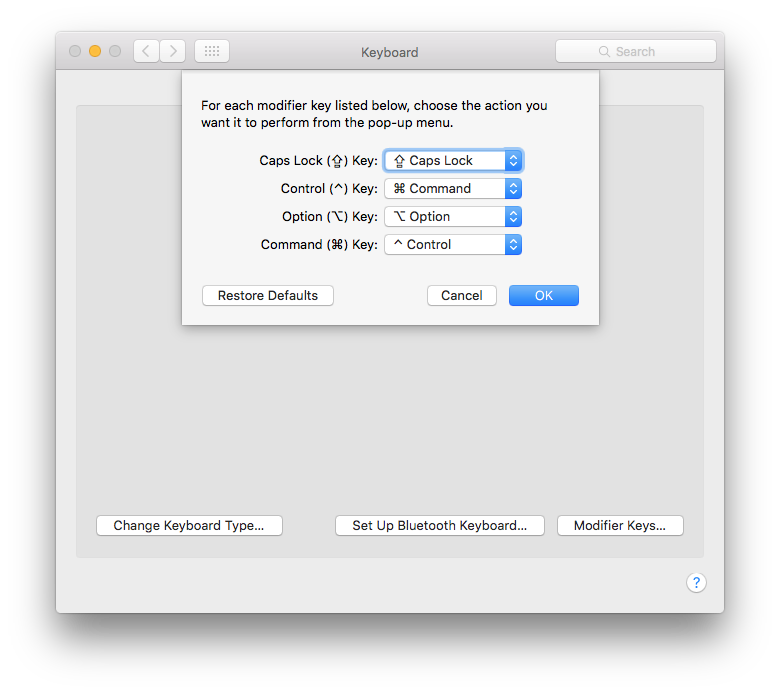 Change left Cmd key to Ctrl Key wihout changing the right Cmd key in Macbook Pro High Sierra?